Help : Define how and when you want the commissions to be calculated and to whom to pay it. The Commissions Window allows you define how commissions and royalties will be paid. 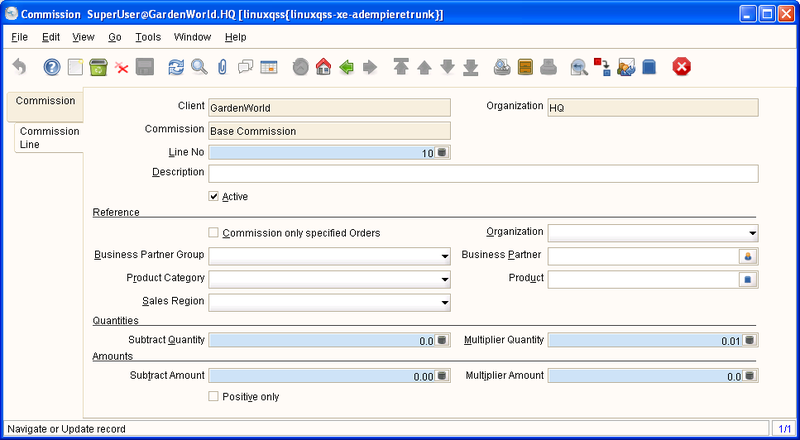 You can pay multiple commissions for the same order or invoice (e.g. to the person entering the transaction, to the person responsible for sale of the product (category) and or business partner (group). Help : Define when to pay a commission to whom. For each period, you start the calculation of the commission after the transaction for that period are completed or closed. Help : Define the selection criteria for paying the commission. If you do not enter restricting parameters (e.g. for specific Business Partner (Groups) or Product (Categories), etc. all transactions for the period will be used to calculate the commission. You can choose, that only positive amounts (Converted Amount - Subtract Amount) and positive quantities (Actual Quantity - Subtract Quantity) are used in the calculation. This page was last modified on 14 December 2006, at 13:18.